All the important information available at a glimpse. Get a full overview of shop information, recent orders, monthly report, top sales, top hits or recent reviews. Quick access to any store manage sections. EShop allows you to exports data for your store (products / categories / manufacturers / customers / orders / Google Feeds) easily so you can use that data for other purpose out of store. No Matter if you want to sell 1 or 1 000 000 products, EShop has your back. Almost of EShop sections as layouts, notification emails, invoices, image size, sorting, etc can be fully configured as your expect. EShop is also integrated with some other systems / extensions to make it more powerful and flexible. EShop offer you to display the stock information or out of stock status of product when it is out of stock. This allows you to update stock of multiple products in Batch to save your time. So instead of open products one by one to update stock, you can choose multiple products from the list to update their stock just one time. EShop supports a rich set of ways to browser products on the front-end side. So you can display products in grid / list / table layout OR in Joomla article OR in modules on any positions / pages that you want. You can extend / override the default theme or develop a new theme to display store as you expect. All of layouts in EShop can be also overridden from the Joomla template without losing when you update EShop in the future. EShop is fully responsive and mobile-friendly. It supports all of Bootstrap 2 / Bootstrap 3 and Bootstrap 4 so it is compatible with any Joomla templates. After installing EShop, you just need to publish EShop pages to the template that you are using, then go to the Configuration of EShop to choose Bootstrap version to use depends on the Bootstrap version of template. With EShop, customers can find the expected products easily by using filters module, quick Search module, advanced search module or via Joomla search. EShop allows you to setup different tax rates that apply to customers from different locations based on Geo Zone. So you can sell your products to customers from any where in your country as well as over the world. Display and sell products in multiple currencies. Allow customers to buy in the their expected currency. EShop updates the currency exchange value for you automatically. All you have to do is create the currencies and publish the currency switcher module. EShop supports multilingual out of the box. Once you enable multiple languages plugin in your site, then you can enter the data in multiple language for your store. EShop has been already translated into many different languages amd ready for you to use. EShop allows you to add any information types of product and display that information to customer easily use Product Attributes feature. So customer can group these information and compare between products to find the expected products. You can add more tabs in product details page to display more different information for each product as Videos, Attachments, Documentation, etc. easily. This is another powerful feature of product. So you can also add any custom information of a product as you want. Increase sales by offering discount coupon codes. Run promotions and attract more customers by giving them discounts when checking out. Retain customers by offering them redeemable vouchers. Offering a voucher encourages customers to come back and purchase more products. Offer discounts to customers for bulk purchases. So BUY MORE to get LOWER PRICE. Sell your products at different prices to different customer groups of your store. Allow customers to share products to popurlar social networks. It also allow customers to invite more their friends to view and purchase the products. 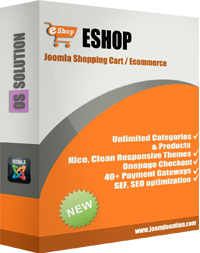 All of EShop pages on the front-end side are designed in the best way for SEO. It is using advantage of the Microdata / Rich snippet for product. With EShop, the entire checkout process is painless and uses Ajax technology that walks through the customers step by step without refreshing the page. Customers can place orders quickly and with confidence. Besides checkout as a register user, EShop also allows customers to checkout as guest. So customers don't need to register account or log in, they can still checkout as guest quickly. EShop allows you to manage which fields information to appear at the checkout easily. All most fields can be configured to show / hide as you want easily. Besides default built-in fields, you can add more fields to collect more information from customers at checkout as you want. Very flexible and easy. EShop supports multiple built-in shipping plugins which allows you to define shipping cost for your store based on different shipping rules easily. Besides default payment plugins, we also developed many payment plugins for EShop to make it useful for everyone from any countries over the world. Browse all EShop payment plugins. This plugin allows you to use Paypal Pro (Creditcard payment) payment gateway for processing payment in EShop extension. This plugin allows you to use Stripe (https://stripe.com/) payment gateway for processing payment in EShop extension. This plugin allows you to use Sofort Überweisung (https://www.sofort.com/) payment gateway for processing payment in EShop Shopping Cart extension. This plugin allows you to use Squareup (https://squareup.com/) payment gateway for processing payment in EShop Shopping Cart extension. This plugin allows you to use Cybersource (http://www.cybersource.com/) payment gateway for processing payment in EShop Shopping Cart extension. This plugin allows you to use FirstData E4 payment gatewayfor processing payment in Eshop extension. This plugin allows you to use Securepay payment gateway for processing payment in EShop extension. This plugin allows you to use Payflow Pro payment gateway for processing payment in EShop extension. This plugin allows you to use Sagepay payment gateway for processing payment in EShop extension. This payment plugin in allows you to accept creditcard payments via NAB Transact(Australia) payment gateway EShop extension. This plugin allows you to use WorldPay (http://www.worldpay.com) payment gateway for processing payment in EShop extension. This plugin allows you to use Payfast (https://www.payfast.co.za) payment gateway for processing payment in EShop extension. This plugin allows you to use iDeal Mollie payment gateway for processing payment in EShop extension. This plugin allows you to use Sisow (https://www.sisow.nl) payment gateway for processing payment in EShop extension. This payment plugin in allows you to accept payments via Authorize.net SIM (server integration method) payment gateway in EShop extension. This plugin allows you to use CCAvenue payment gateway for processing payment in EShop extension. This payment plugin in allows you to accept payments via Migs: MasterCard Internet Gateway Service (Australia) for EShop Shopping Cart extension. This plugin allows you to use Moneris payment gateway for processing payment in EShop extension. Eprocessing Network payment plugin for EShop. This plugin allows you to use IPay88 (a Malaysia payment gateway) payment gateway for processing payment in EShop extension. This plugin allows you to use Paytrace payment gateway for processing payment in EShop extension. This plugin allows you to use Braintree payment gateway (https://www.braintreepayments.com) for processing payment in EShop extension. This plugin allows you to use BPOINT payment gateway (https://www.bpoint.com.au) for processing payment in EShop extension. This plugin allows you to use Merchante - Solutions payment gateway (https://www.merchante-solutions.com) for processing payment in EShop extension. This plugin allows you to use Buckaroo (http://www.buckaroo.nl) payment gateway for processing payment in EShop Shopping Cart extension. This plugin allows you to use CardSave (https://www.cardsave.net/) payment gateway for processing payment in EShop Shopping Cart extension. This plugin allows you to use First Data Connect Gateway (http://www.firstdata.com/product_solutions/ecommerce/global_gateway/index.htm) payment gateway for processing payment in EShop Shopping Cart extension. This plugin allows you to use Netaxept (http://www.betalingsterminal.no/Netthandel-forside/Teknisk-veiledning/Overview/) payment gateway for processing payment in EShop Shopping Cart extension. This plugin allows you to use Netbanx (http://www1.netbanx.com/) payment gateway for processing payment in EShop Shopping Cart extension. This plugin allows you to use PaymentExpress PX Pay (https://www.paymentexpress.com/) payment gateway for processing payment in EShop Shopping Cart extension. This plugin allows you to use PaymentExpress PX Post (https://www.paymentexpress.com/) payment gateway for processing payment in EShop Shopping Cart extension. This plugin allows you to use PIN (https://pin.net.au) payment gateway for processing payment in EShop Shopping Cart extension. This plugin allows you to use Securepay DirectPost payment gateway for processing payment in EShop Shopping Cart extension. This plugin allows you to use TargetPay (https://www.targetpay.com/) payment gateway for processing payment in EShop Shopping Cart extension. This plugin allows you to use FirstData Payeezy payment gateway for processing payment in EShop Shopping Cart extension. This plugin allows you to use PayU Latam (http://www.payulatam.com/) payment gateway for processing payment in EShop Shopping Cart extension. This plugin allows you to use PayPlug payment gateway (https://www.payplug.com/) for processing payment in EShop extension. This plugin allows you to use Saferpay payment gateway for processing payment in EShop extension. This plugin allows you to use Epay (http://www.epay.dk/) payment gateway for processing payment in EShop extension. This plugin allows you to use BluePay (https://www.bluepay.com/) payment gateway for processing payment in EShop extension. This plugin allows you to use Elavon CONVERGE payment gateway for processing payment in EShop extension. This plugin allows you to use Skrill (https://www.skrill.com) payment gateway for processing payment in EShop extension. This plugin allows you to use PayUmoney (https://www.payumoney.com/) payment gateway for processing payment in EShop Shopping Cart extension. This plugin allows you to use Beanstream (http://www.beanstream.com/) payment gateway for processing payment in EShop Shopping Cart extension. This plugin allows you to use Paynow (https://www.paynow.co.zw/) payment gateway for processing payment in EShop Shopping Cart extension. This plugin allows you to use Pagseguro (https://pagseguro.uol.com.br/) payment gateway for processing payment in EShop Shopping Cart extension. This plugin allows you to use Spgateway (https://web.spgateway.com) payment gateway for processing payment in EShop Shopping Cart extension. This plugin allows you to use RedSys (http://www.redsys.es) payment gateway for processing payment in EShop Shopping Cart extension. This plugin allows you to use PlugNPay (https://www.plugnpay.com) payment gateway for processing payment in EShop Shopping Cart extension. This plugin allows you to use Billplz (https://www.billplz.com) payment gateway for processing payment in EShop extension. This is USPS (United States Postal Service) shipping plugin for EShop e-commerce extension. It gives you the ability to use USPS services for shipping products to your clients.